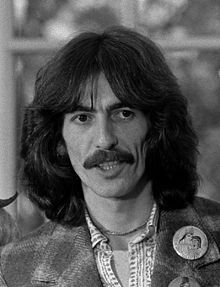 George Harrison, MBE (25 February 1943 – 29 November 2001) was an English rock guitarist, singer-songwriter, author and sitarist best known as the lead guitarist for The Beatles. 1965, February 25, George's 22nd birthday, filming Help in the Bahamas, Swami Vishnu Devananda 'walked up' and 'gave us a book'. It was not opened until 2 years later. 'after first visit to India (1966) became a friend of Ravi Shankar' - next chapter 'first met Shankar in 1965' - otherwise 'late spring' 1966 -dinner at the home of Mr. Angbadi who ran the Asian Music Circle in London. later Ravi to Esher with Allah Rakha, tabla - sitar lesson for George; John and Ringo watching. acquired Paramhansa Yogananda's 'Autobiography of a Yogi' - either from the Indica bookshop or from Ravi Shankar. Joshua Green, the author of "Here Comes the Sun: The Spiritual and Musical Journey of George Harrison", attended several recording sessions with George. He said there would always be 'huge trays of vegetarian food' in the studio.